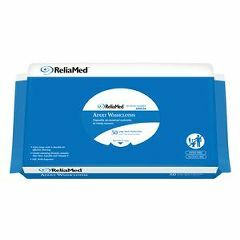 Reliamed Disposable Premium Washcloths is a super strong and soft washcloths with easy, single-hand dispensing that eliminates cross contamination. No unfolding required. Alcohol free, with aloe. Clinically tested for mildness to skin. works great wife is incontinent. nurse. nurse, entering old age. These wipes are much better and more reasonable than retail store baby wipes. They are larger than baby wipes, which is better for adult use. too thin to be effective. These were inexpensive, but you get what you pay for I guess. I was not happy with the quality of these wipes. Much too thin for intended use of adult diaper changes. gentle . gentle . good size . doesn't sting . superior to baby wipes . none for type of product . quick clean . bathroom light . bathroom wipe. bathroom wipe. face wipes to replace baby wipes because of alcohol in baby wipes. they are fantastic. No singing on open skin and very clean. Excellent size. I would recommend them to anyone. if you use them in the bathroom throw them out did not flush them. They are not disposed of that way. I have and will continue to buy this. These have been a lifesaver for us and family members for whom we bought.